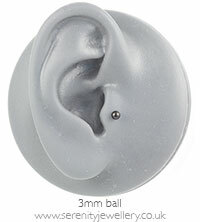 Hypoallergenic black PVD titanium labret studs secured by 3mm or 4mm screw-on balls. 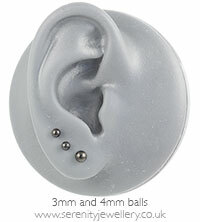 The flat back makes these studs particularly comfortable to sleep in. I love these earings. I have them in multiple colours. Comfortable. Good price and delivery. I don't buy anywhere else. Love these! 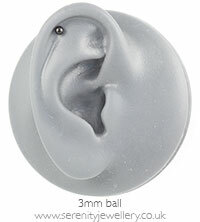 Feel and look great, plus they don't irritate my ear like most others do! 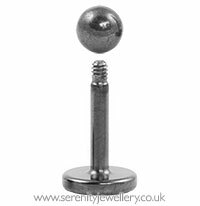 Great quality labret studs delivered faster than superman ! So pleased I ordered some more with a different bar length and different ball size, these were also delivered faster than a speeding train ! 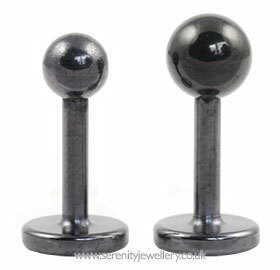 I love the black labret studs, very practical, quite Gothic looking when several are worn together! I would think these are a good earring for males too. Quick delivery, I would buy more. Tuesday, 21 August 2012 | Jenny.